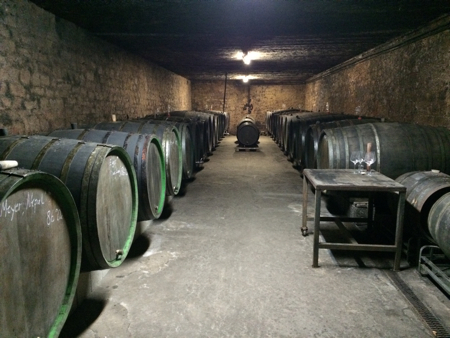 The cellar at Hofgut Falkenstein. The Weber family farms about 8 hectares of mainly old Riesling vines—over 1 hectare ungrafted—in a side valley of the Saar, known as Tälchen (“little valley”). In 1985, Erich Weber and his wife, Marita, built up the property of the then-dilapidated Falkensteinerhof (established in 1901) from scratch. All the Riesling grapes are hand-harvested and the whole grapes are gently pressed in a pneumatic press for two to three hours. The musts are left overnight to settle naturally and are vinified with ambient yeasts in 1,000-liter old oak Fuder casks. Their top vineyard sites are located on various south-facing hillsides, including the once highly prized wines from Niedermenniger Herrenberg, Niedermenniger Sonnenberg, Krettnacher Euchariusberg, and Krettnacher Altenberg. The soil is primarily gray slate, with some quartz. The father-and-son team of Erich and Johannes Weber don’t use herbicides and believe in low yields (one flat cane per vine) to produce an array of green-tinted, light-bodied, high-acid, unchaptalized dry (trocken), off-dry (feinherb), and sweet Saar wines—all of which are cask-by-cask bottlings. Below is a selection of 2016 Saar Rieslings, with a few short descriptions of each wine. Fuder Meyer: lean, pear, and nervy. The Webers have also recently signed a long-term lease for an ungrafted old-vine parcel called Im Kleinschock. On Clotten’s 1868 Viticultural Map of the Saar and Mosel, this south-to-southwest-facing hillside is listed as “Schock.” This is the Webers first parcel in Kleinschock. It now gives them three distinct plots of ungrafted old vines, to go along with vineyards that have a mix of ungrafted vines. Kleinschock, listed as “Schock” on Clotten’s 1868 Saar and Mosel map, is a hillock located close to Euchariusberg and is offically in a part of the enlarged post-1971 Niedermenniger Sonnenberg. The main south-facing Euchariusberg hillside has the place name Großschock, where the Webers have various contiguous parcels that cover about 1.8-ha of the dark-red section on the map. The 2016 Euchariusberg Kabinetts from Hofgut Falkenstein are three separate Fuder casks—hence the different AP numbers. All three are from old vines in the prime south-facing slope of Euchariusberg, also known as Großschock. This sector dates back a long time ago and is colored dark red on Franz Josef Clotten’s 1868 Viticultural Map of the Saar and Mosel. (Some parts of the Scharzhofberg, such as Pergentsknopp, weren’t even planted until the late 19th century.) The Kabinett AP number 8 (Gisela), with the words “Alte Reben” on the label, designates a block of old, ungrafted vines. This has a more herbal aroma than the other two. The Webers and I judge this to be the most impressive of the three. The AP number 12 (Kugel Peter) is an old-vine plot adjacent to Gisela. We’re very excited about the quality of the 2016 vintage across the board. The 2016 Euchariusberg Spätlesen and Auslese come from a higher and steeper section of Großschock. Jean Fisch and David Rayer of Mosel Fine Wines “were simply blown away this year by the quality of the 2016 vintage at Hofgut Falkenstein!” Before the rave reviews from Mosel Fine Wines came out yesterday, Hofgut Falkenstein was already getting plenty of hype in Germany from the Mythos Mosel event and the BerlinKabinettCup. Most of our merchants in Germany are already sold out of the 2016s. For what it’s worth, the 2016 Euchariusberg Kabinett AP 12 (Kugel Peter) came in third place at the BerlinKabinettCup tasting of 47 Kabinetts. Mosel Fine Wines rated the 2016 Euchariusberg Kabinett Alte Reben AP 8 (Gisela) as “one of the very best young Kabinett we have ever tasted and a great tribute to this uniquely light and elegant style of Riesling!” Just to put this in perspective, they rated Egon Müller’s 2015 Scharzhofberger Kabinett Alte Reben AP 3 with the same score of 95 points the year before. That wine costs a small fortune. All the 2016 Euchariusberg wines—the Kabinetts, the Spätlesen, and the Auslese—are from different old-vine parcels in Großschock. The Webers have pretty much the entire core part of this south-facing hillside. Their holdings are contiguous in this old sector (Großschock III. and IV. Peil on the cadastre map). The Spätlesen and Auslese come from separate plots, picked en bloc—as all their wines—in the steeper section of Großschock (IV. Peil). The plot of old, ungrafted vines for the Kabinett designated “Alte Reben” (Gisela, AP 8) is located in Großschock III. Peil (block numbers 92, 93, and 94); the AP 12 (Kugel Peter) comes from a parcel adjacent to the ungrafted vines. “The finest vineyards of the Saar are on the right bank of the river, from Geisberg in the south to Euchariusberg in the north,” André L. Simon wrote in Wine and the Wine Trade (1921). In Zeitschrift des Königlich Preussischen Statistischen Bureaus: 1871: “Among the best sites on the Mosel and the side valleys, one considers in the Trier district: Thiergärtner, Avelsbacher, Olewig-Neuberger; in the Trier rural district: Oberemmeler (especially Rauler, Agritiusberger), Krettnacher, Niedermenniger (Euchariusberger); in the Ruwer Valley: Grünhäuser, Kaseler, Eitelsbacher; in the Wittlich district: Piesporter, Ürziger, Kinheimer, and Kröver; in the Bernkasteler district: Oligsberger and Neuberger, Brauneberger, Doctor by Bernkastel, Josefshof by Graach, Wehlener, Erdner, and Zeltinger. On the Saar and its side valleys in the Saarburg district, the better sites include Wiltinger (especially Scharzhofberger), Ockfener, Schodener, Ayler, Kanzemer, Wawerner. For those who have Instagram, I tagged myself on the photo of Euchariusberg in the old, ungrafted plot nicknamed Gisela for the Kabinett Alte Reben (AP 8). The rows run in a slightly different direction. 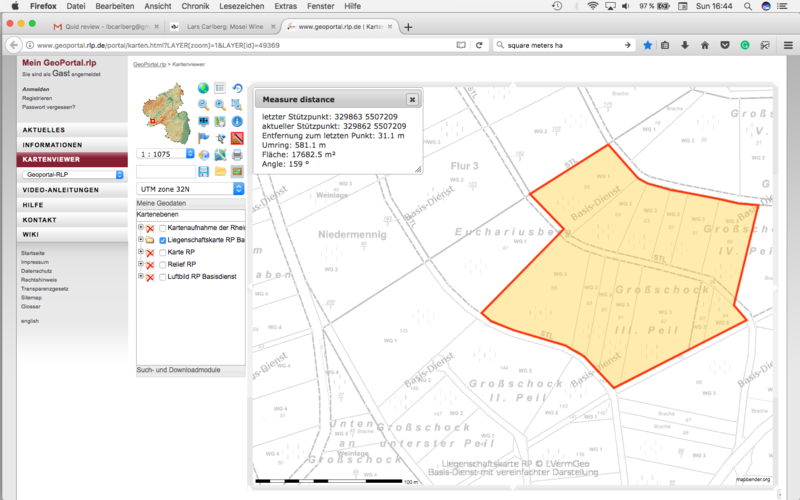 The adjacent plot is Kugel Peter (AP 12) Kabinett. The plots above these are for the Spätlesen and Auslese. To the far left, just after the new planting, is an excellent plot that made the Klaus “Lang” (AP 13) Kabinett. All of these various parcels have old vines. The Webers own in one continguous block about 1.5 ha in Großschock. Euchariusberg had a class 3 rating for the tax on wine. The Scharzhof (and Grünhaus) had class 1. No other village on the Saar was higher than Euchariusberg. Ayl, Saarburg, and Wawern were rated class 4. These taxes on wine were used as the basis for Clotten’s 1868 Viticultural Map of the Saar and Mosel. Johannes, his older brother, Franz, and I will attend Rieslingfeier in NYC on January 27. We hope to see some of you there. A number of you have asked me why the Spätburgunders are now labeled as “Red Wine.” The authorities decided that a high level of shikimic acid in the 2015 reds means that it can’t be Spätburgunder. The Webers don’t want to bother with this and chose to simply label the wines without the grape variety. But they don’t believe that it’s a mutation. This affected a number of producers that sold Pinot Noir to the co-op.